The principal cause of the sack was the delay in payment due to the soldiers by Philip II. Spain had recently declared bankruptcy. The bankers refused to perform the transactions asked of them by the king of Spain until they had reached a compromise. Case in point, the transfer from Spain of the troops' salary could not be performed by letter of exchange (the 16th-century equivalent of a money order). So the Spanish government had to transfer the actual cash by sea - a much more expensive, slow and perilous operation. Unfortunately for Philip, 400,000 florins intended as payment to the troops were seized by the government of Elizabeth I when ships containing the florins sought shelter from a storm in English ports. 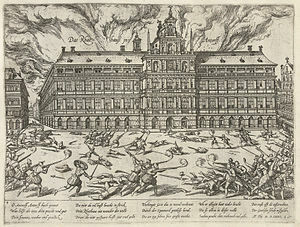 The Spanish soldiers, angry at fighting without rest or pay against the Dutch rebels, had already sacked Zierikzee and Aalst, causing the fifteen loyal provinces (Holland and Zeeland were in the hands of the rebels) to come together in States-General with the purpose of removing the mercenaries from the Netherlands. It was common procedure with the soldiery at that time, and their procedure was invariable. Without breaking their celebrated discipline, they would choose a new leader, or Eletto, from their number, and march in perfect order under him to whatever their target was. In this instance the Spanish soldiers decided to find for themselves their belated pay, by looting Antwerp. The idea to sack Antwerp came from the Spanish commander of the Citadel of Antwerp, Sancho d'Avila. He tried to convince the commander of the German troops in the city, Count Otto IV van Eberstein, son of William IV of Eberstein, to deliver the city to the Spanish. However, Eberstein warned Governor Compagny (or Champagny) of Antwerp, and together, they improvised defences against the Spanish. On 3 November, Compagny let a force of 6,000 Walloon troops under the Marquis of Havré into the city. That was a risk because these troops were not very trustworthy. Some 10,000 civilians also helped to raise improvised defences against the Citadel. D'Avila had also prepared his attack and contacted other Spanish mutinous troops in Aalst, Lier, Breda and Maastricht, which converged on the city. On November 4 at 11:00, the Spanish attacked. The civilian defences were useless against the battle-hardened Spaniards, who swarmed into the city. As had been feared, the Walloons did not fight but fled or even participated in the looting, according to different sources. The Germans and civilians tried to resist but were no match for the Spaniards. Eberstein drowned in the Schelde when he tried to escape. Some 7,000 lives and a great deal of property were lost. The cruelty and the destruction of the three days of pillage became known as the Spanish Fury. 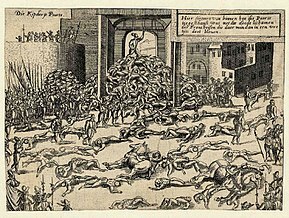 This shocking event stiffened many in the Netherlands, even many Catholics, against the Spanish Habsburg monarchy; and further tarnished Philip's declining reputation. The States General, influenced by the sack, signed the Pacification of Ghent only four days later, unifying the rebellious provinces with the loyal provinces with the goal of removing all Spanish soldiers from the Netherlands, as well as stopping the persecution of heretics. This effectively destroyed every accomplishment the Spanish had made in the past 10 years, since the start of the Dutch Revolt. Furthermore, it brought about the ruin of the Antwerp Cloth Market. English traders, not wishing to risk visiting a town that now resembled a war zone, sought out new commercial links. By 1582, all English trade to Antwerp had ceased. The city's large Jewish population was especially hard hit and Antwerp subsequently lost its status as one of the richest, most influential cities in Europe; it recovered but was never to recapture its former glory. The sack led to Antwerp's decline from the economic, financial and cultural center of the Netherlands and paved the way for Amsterdam's rise. This event also added to Spain's Black Legend. Sack of Rome (1527), the unpaid Imperial troops loot Rome. ^ Nolan, Cathal (2006). The Age of Wars of Religion, 1000-1650: Encyclopedia of Global Warfare and Civilization, Volume 2. Greenwood Publishing Group. p. 799. ^ Ireland: 1641: Contexts and Reactions. Oxford University Press. 2013. p. 179. ^ Kamen, Henry (2005). Spain, 1469–1714: a society of conflict (3rd ed.). Harlow, United Kingdom: Pearson Education (Limited online by Google Books). p. 326. ISBN 0-582-78464-6. ^ Motley, John Lothrop (1855). The Rise of the Dutch Republic. This page was last edited on 24 November 2018, at 11:54 (UTC).